We all know of families or marriages in crisis. When those suffering in such situations turn to us for help, where do we turn? 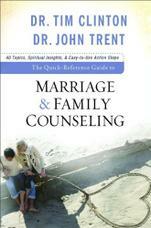 The Quick-Reference Guide to Marriage and Family Counseling provides the answers. It is an A-Z guide for assisting people-helpers--pastors, professional counselors, youth workers, and everyday believers--to easily access a full array of information to aid them in (formal and informal) counseling situations. Issues addressed by Clinton and Trent include affairs and adultery, communication in marriage, parenting, sibling rivalry, and many more.